In western Cambridgeshire, tucked away among the muddy fields, hedges and paths is a still active RAF station with a long and fascinating hisory. Royal Air Force Station Molesworth, almost always shortened to RAF Molesworth, was first constructed in 1917 and remains in use today by the U.S. Air Force. One can almost picture the B.E.2s of the Royal Flying Corps which operated out of Molesworth during the Great War, conducting training and preparations for flyers preparing to transfer with their aircraft to France. The No. 75 Squadron occupied the airfield for sometime during this period. However, the airfield was abandoned after the war ended and went into disuse. Some of the buildings which had supported the air station where incorporated into the local farms near Bington, Old Weston, and Molesworth. Unattributed photo of a wartime Avro B.E.2c, a reconnaissance plane and from the Great War, with ‘V” undercarriage, streamlined engine cowling, and the upper wing cut-out for the tail gunner to improve field of fire. Sadly, there are no photographs of B.E.2’s operating from RAF Molesworth during the war that I have been able to locate. Despite the hopes of a generation, the horror of World War was to be experienced once again. As the United Kingdom found itself drawn into the conflict with the German invasion of Poland in 1939, it was not long before the Air Ministry decided to recommission the abandoned aerodrome at Molesworth. Through 1940, the runways were laid and the base infrastructure constructed to support bombers. The Royal Australian Air Force flew Vickers Wellington IVs, a medium bomber, from Molesworth from November 1941 until January of 1942 under the Royal Australian Air Force’s No. 460 Squadron. After the Australians, the RAF’s No. 159 Squadron occupied the airfied for a short time, but did not conduct flight operations from Molesworth. It was the arrival of the U.S. Army Air Forces after America’s entry into the war that would transform Molesworth into one of the major bomber bases in England. Upgraded to a Class ‘A’ Airfield intended for use by the “heavies” – the four-engine bombers that would take the strategic bombing campaign to occupied Europe and Germany – Molesworth was radically altered and underwent major upgrades. 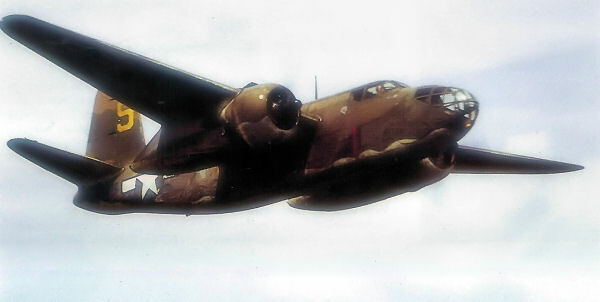 This Douglas A-20C HAVOC/BOSTON III, serial number AL672, was flown on the 4 July 1942 low-level attack against Luftwaffe positions in the Netherlands at the time part of the 15th Bombardment Squadron (light). 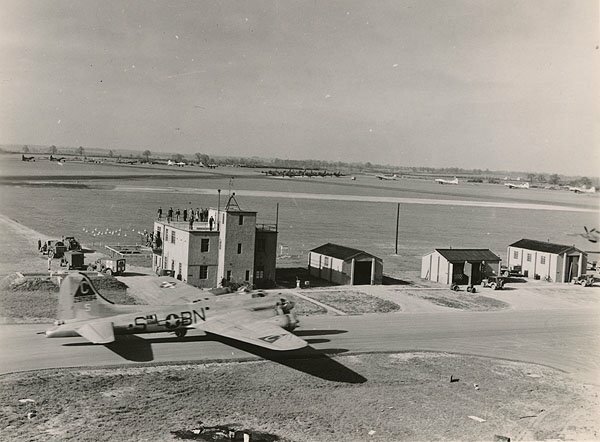 This photograph was taken later in the war when AL672 was flying as a staff communications aircraft for the 8th USAAF out of RAF Bovingdon. Photograph from the U.S. Army Air Forces via the National Arcives. Thanks to Roger Freeman: “The Mighty Eighth, the Colour Record” 1991. The 15th Bombardment Squadron departed RAF Molesworth for operations in North Africa under the 12th Air Force in September 1942. It was at this time that the B-17 Flying Fortresses began arriving at RAF Molesworth, the four squadrons that would eventually comrpise the 303rd Bombardement Group (Heavy) which would fly from Molesworth until the end of the war. The 303rd Bombardment Group, consisting of the 358th, 359th, 360th and 427th Bombardment Squadrons, was destined to become one of the legendary units of the Second World War under the 8th Air Force. 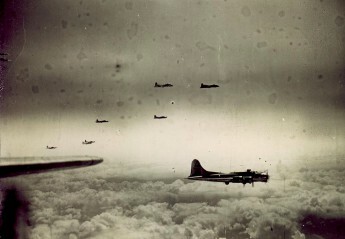 The first mission by the 303rd Bomb Group was flown on 17 November 1942, targeting military targets in occupied France. On 27 January 1943, the 303rd began flying missions against Germany, taking part in the 8th Air Force’s first bombing mission against Germany proper – the U-boat facilities at Wilhelmshaven. For the next two and a half years the 303rd would fly missions deep into German territory: to the ball-bearing factories at Schweinfurt, against factories and shipyards, against rail-yards and distribution centers for the Wehrmacht. During the D-day invasion of Normandy, the 303rd bombed the Pas de Calais and then later supported the breakout from St. Lo in July 1944. It supported the army in the Battle of the Bulge and in the crossing of the Rhine in March 1945. On 25 April 1945, the 303rd flew its last mission from RAF Molesworth attacking the German armaments factory complex at Pilsen. The RAF Molesworth control tower in April 1944. On the taxiway is a B-17G, tail number 42-97284 “Ain’t Misbehavin” – she would fly a total of 48 combat missions during the war. The “Triangle-C” marking on the verticle stabilizer was the RAF Molesworth designator. The Class A Airfield imporvements: three converging airstrips with a concrete runway of at least 6,000 feet are visible in the distance. Photograph by Mr. Milton “Chic” Cantor, the photographer of the 303rd BG(H), with thanks to the 303rd “Hell’s Angels” historical society. The 303rd Bomb Group (Heavy) flew a total of 364 missions from RAF Molesworth, comprising 10,271 sorties. The bombers shot down a confirmed 378 aircraft with 104 additional aircraft as probables. 817 men from the 303rd were killed in action and 754 become prisioners of war. After the war, the 303rd Bomb Group (Heavy) departed Molesworth for the United States via North Africa. 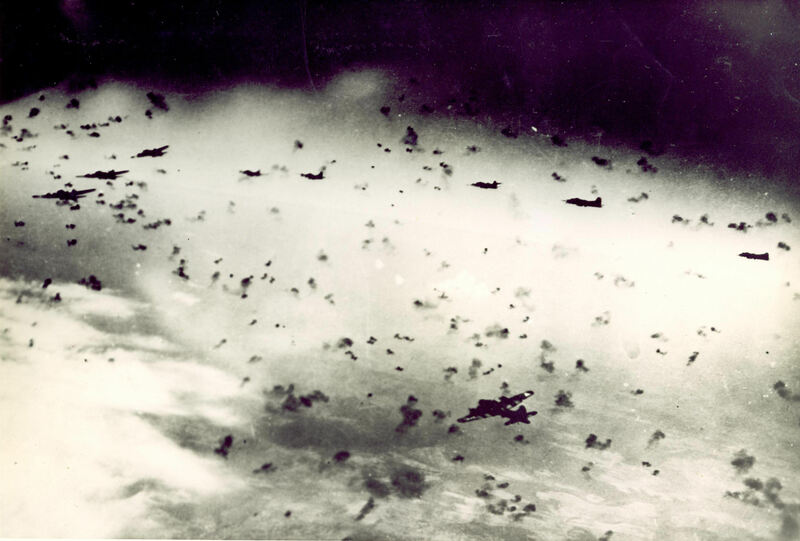 22 May 1944: 303rd B-17s on a bombing mission to Kiel, Germany taken at 25,000 feet. Photo from the Peter M. Curry Collection. The airfield was returned to the Royal Air Force in July 1945 where it was used for jet trainers and Gloster Meteor IIIs were operated from Molesworth for a short period. On 10 October 1946 the training unit left and the airfield was placed in ‘care and maintenance’. In 1951, the U.S. Air Force returned to RAF Molesworth, hosting the 582nd Air Resupply Group. The runways, taxiways and hardstands were all improved and the airfield became a critical logistics airbase for the Cold War. The 582nd provided air support – paratroop airdrops and resupply – to the U.S. Army’s 10th Special Forces Group which was stationed in Bad Tolz, Germany. The 582nd Air Resupply Group flew a variety of aircraft from Molesworth, from B-29s to C-119 Flying Boxcars and HU-16 Albatrosses. At the time, the 582nd was treated as a normal resupply group; however, its support to Army Special Forces, which were trained to infiltrate the Iron Curtain if needed, must be wondered at. On 25 October 1956, the 582nd was reorganized and called the 42nd Troop Carrier Squadron Medium (Special). They flew HU-16s Albatrosses, C-47 Dakotas, C-119 Flying Boxcars, and C-54 Skymasters from RAF Molesworth until 3 May 1957 when the aircraft moved to RAF Alconbury. However the squadron had a short life at Alconbury and was inactivated on 8 December 1957. The C-54s and C-47s were transferred to Rhein-Main AB, Germany. The C-119s were sent to the 322nd Air Division at Evreux-Fauville AB, France. Of personal note, my grandfather was a C-119 pilot in the 322nd Air Division in Evreux-Fauville AB France at the time, a young U.S. Air Force lieutenant. 25 October 1955: HU-16 Albatross of the 582nd Air Resupply Group at RAF Molesworth. This image or file is a work of a U.S. Air Force Airman or employee, taken or made as part of that person’s official duties. As a work of the U.S. federal government, the image or file is in the public domain. RAF Molesworth went into a maintenance status for the next twenty years, finally being deactivated officially in 1973. Only marginal maintenance was performed at Molesworth by U.S. Air Force personnel stationed a few miles away at RAF Alconbury. That changed in June 1980 when RAF Molesworth was chosen to house nuclear weapons – the BGM-109G Ground Launched Cruise Missiles or GLCMs – under the 303rd Tactical Missile Wing. The Ministry of Defence now worked on building the massive GLCM bunkers that have become a hallmark of the west Cambridgeshire countryside. All the World War II runways, taxiways and hardstands were removed. Only three large hangers from the World War II period remained. Old infrastructure from the 1950s was demolished and new buildings constructed. By December 1986, the 303rd Tactical Missile Wing was activated but when the United States and the Soviet Union signed the INF Treaty in 1987, all nuclear weapons were removed from RAF Molesworth by October 1988. In January 1989 the 303rd Tactical Missile Wing was deactivated. 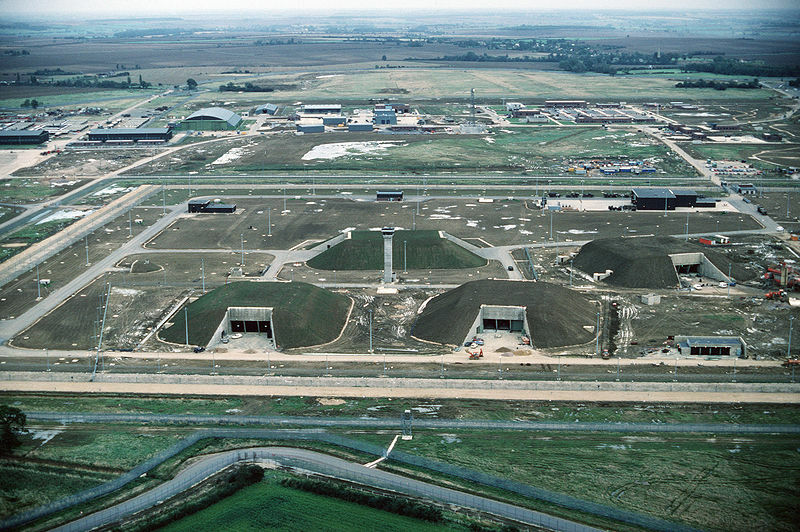 1989: the GAMA (GLCM Alert and Maintenance Area) at RAF Molesworth is completed for the housing of short-range nuclear weapons. This image or file is a work of a U.S. Air Force AIrman or employee, taken or made as part of that person’s official duties. As a work of the U.S. federal government, the image or file is in the public domain. During the 1980s, regular protests occured at Molesworth due to the stationing of nuclear GLCMs at the facility – part of the peace camp can still be seen outside the main gates of RAF Molesworth. This was part of the European-wide effort to oppose NATO’s basing of tactical nuclear cruise missiles in Europe which was seen at the time as a dramatic escalation in the final years of the Cold War. It was only the removal of the cruise missiles that led to the end of the protests. In 1990, the Royal Air Force announced that RAF Molesworth would house the U.S. European Command’s Joint Analysis Centre, which still operates at the base today, still controlled by the U.S. Air Force. 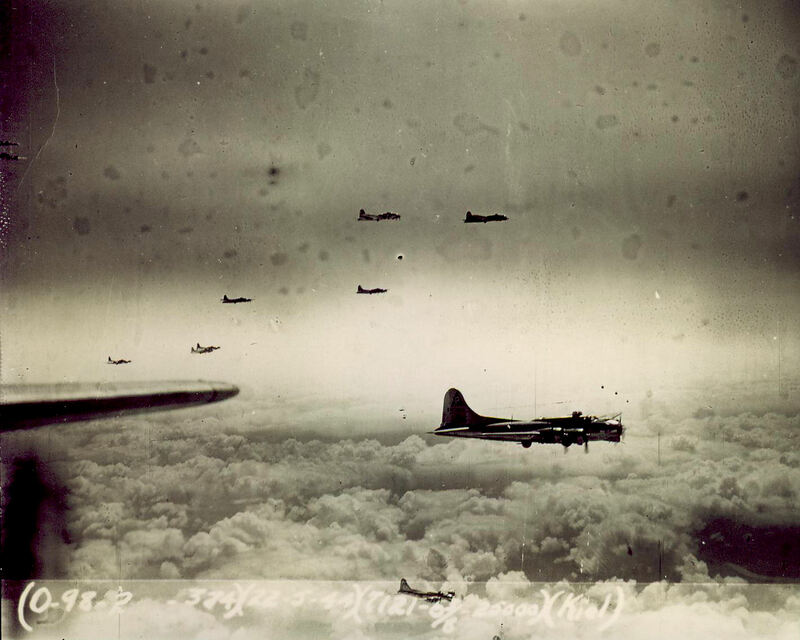 The 303rd Bomb Group (Heavy), the Hell’s Angels maintains an indepth and fascinating webpage: http://www.303rdbg.com where many more photos, additional details and stories on the brave men who flew from RAF Molesworth can be read and shared. Read this article: http://www.heritagedaily.com/2014/01/raf-molesworths-ground-launched-cruise-missiles-25-years-on/100785 from the Heritage Daily by Cindy Eccles.